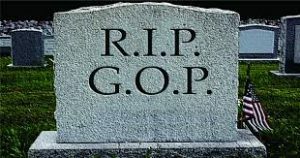 For true conservatives and Christians, the slow death of the Republican Party in America has been clearly observable for quite some time now. One RINO loser after another has been put forward by the GOP establishment machine to become POTUS, and one loss after another to the Democrats has occurred. Many have asked if the Republicans can any longer be called a conservative party. It seems the just-held convention in Cleveland has dispelled any lingering doubts about this. Ramming through the most hostile candidate to Christian and conservative values in recent memory is of course the major indicator of a party that has long ago given up the ghost. Electing a lifelong liberal, Democrat supporter, and Clinton supporter, to take on the liberals, the Democrats, and Clinton, is as insane as you can get. It is as if the Dems did a deal with Donald to get Hillary into the White House. And the Republican establishment went along with this. How else does one explain this madness? Trump could have simply remained a Democrat of course, but he knew that Hillary would get the nomination. So he decided to pretend that he was somehow a conservative Republican instead. He fooled plenty of gullible and clueless conservatives, and even some really clueless Christians.